On August 20th 1895, a little girl was born into the assimilated Jewish Pick-family: Marianne Katharina Pick. On March 17th 1942, the inmate Katharina Sara Leichter, born Pick, was gassed at the Psychiatric Institution Bernburg/Saale. It had been a life lived to the fullest these two points, characterized by the struggle for equal opportunities for women, justice and a better world. To everyone who knew her, Käthe Leichter was one of the most interesting and talented women in the Austrian workers’ movement. Käthe grew up with all the comforts afforded to the intellectual Jewish middle-class, on Rudolfs Square in Vienna’s first district. She and her sister were at liberty to explore literature and music in any capacity they wished. With her social commitment to helping her less privileged schoolmates, young Käthe stood out at the secondary school for the daughters of civil servants that she attended. It follows naturally that she soon joined the youth movement, of which she was a member from 1912 to 1914, revelling in the fellowship, discussions and closeness to nature that being part of this community offered. During World War One, Käthe worked in a shelter where she looked after disadvantaged children whose fathers had enlisted and whose mothers had to slave under the war production regime. Her experiences here gave her an insight into the downsides of the proletariats life and struggle. In 1914, Käthe commenced her studies in political science at the University of Vienna. Since women were not officially admitted to this degree, she obtained her doctorate with honors under Max Weber’s supervision in Heidelberg. During her studies, she came across August Bebel’s “Woman under Socialism“, a text that left a great impression on her and confirmed and encouraged her in her fight for the equality of women. After the proclamation of the Republic of German-Austria in November 1918, Käthe joined the “New Left“. From then on the young academic was fully immersed in working for the Socialization Commission and was entrusted with problems around the nationalized and socialized industries. She worked very closely with the unions’ women’s sections, as well as with the Social-Democratic Party’s women’s committee. It was around this time that she got married to the journalist Otto Leichter in 1921. Despite their financial difficulties, their sons Heinz (born 1924) and Franz (born 1930) joined the young family soon after. In 1924, Käthe Leichter was put in charge of establishing a department of women’s affairs in the Vienna Chamber of Labor. Her first task was to create a coherent presentation of women’s labor in Austria, so she put together the “Manual of Women’s Work in Austria“ by 1930. Next to the researching, collecting and publicizing of the factual material, Käthe Leichter helped to draft female worker protection regulations and laws. Käthe’s rich and diverse academic and journalistic work, as well as her activity in the Social-Democratic Party (where she never applied for an official position but would always make herself available as keynote speaker when needed), were brought to an abrupt end in February 1943. As the banning of the Social-Democratic Party came into effect, she lost her job in the Chamber of Labor. All of her efforts of finding new employment in Austria remained fruitless. Next to the illegal political work she was doing for the Revolutionary Socialists, she wrote sociological and economic papers on Austria’s female workers’ working conditions for the International Labor Office in Geneva. She conducted a collaborative study for the New Yorker (formerly based in Frankfurt) Institute for Social Research on “Authority and Family” with Paul Lazarsfeld, working with young Swiss people as subjects. As soon as Austria had been annexed by Hitler-Germany in March 1938, Käthe’s husband Otto Leichter fled to Switzerland. 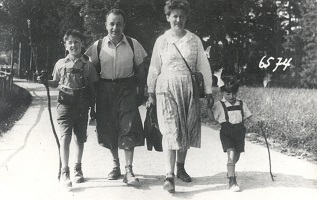 Käthe unsuccessfully sought legal departure possibilities for herself and their two sons. Eventually, the children were able to join their father in safety through the help of friends. Käthe however, was captured by the Gestapo by treachery just before she was able to leave the country. Her first interrogation took place on May 30th 1938 at the infamous and much-feared Gestapo-headquarters on Morzin Square. There were several attempted interventions to get Käthe Leichter released while she was kept in solitary confinement. None led anywhere. In January 1944, she was deported to the concentration camp Ravensbrück, where she went through two years of living hell before she was sent to her death with 1400 other Jewish women. Käthe was an example of resolution and courage until the very end. Photo: Documentation Archive of the Austrian Resistance DOEW_Foto-01297.